When you think of a Christmas cookie, what does it look like? I think most people's first thought is of a sugar cookie. Now, weirdo that I am, I don't actually like regular decorated sugar cookies. All of the frosting and sprinkles and whatnot is a little too much for me. When I think of my perfect sugar cookie, it's warm, buttery, and topped with plain colored sugar. My grandma's recipe for sugar cookies (which I modified slightly because I think she underestimates the amount of sugar that actually goes into the finished cookie) really is one of my favorite cookie recipes of all time. When she used to make these for her annual Christmas party (the only thing that wasn't catered), my sister and I would find the stash and gorge ourselves on them. As an older, much more responsible person, I limit myself to one at a time as to avoid falling into a sugar coma. Mix flour, salt, baking soda, and cream of tartar in a large bowl. Set aside. In another large bowl, cream butter and sugars together. Add eggs, oil, and vanilla. Beat until combined. Slowly mix in flour mixture. If you have the time, chill the dough for one hour to make it more manageable. Using your hands, roll balls of dough and then roll through plain white sugar to coat completely. Place on an ungreased cookie sheet and flatten with the bottom of a glass. Top with colored sugar. Hint - If you're out of a certain color of sugar (ahem, I was missing green), you can mix a couple of drops of food coloring in with plain white sugar. It won't come out perfectly, but the result was good enough for me! Bake at 350 for 10 minutes or until edges are just starting to turn golden. What kind of cookies will you be leaving out for Santa this year? 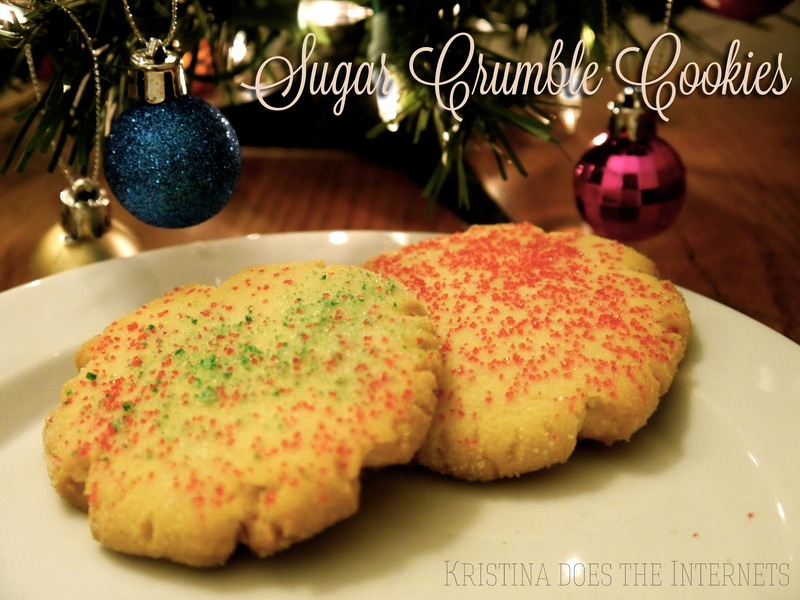 There's something perfect about the simplicity of a sugar cookie. And you're totally right–they scream "holiday season". I love them topped with sugar, too! Yum! Those look delicious. Sugar cookies are my favorite this time of year.